The unemployment rate fell to its lowest level since November 2008, but the government's latest jobs report still shows a muddled picture of the economy. According to the September jobs report, which was delayed 18 days by the government shutdown, hiring slowed last month. But the unemployment rate fell as more workers said they got jobs and joined the labor force. Employers added 148,000 jobs in September, fewer than the 193,000 jobs added in August, the Department of Labor reported. But the good news is the unemployment rate fell to 7.2% as 73,000 people joined the labor force and 133,000 people said they got jobs. That's considered encouraging, after months in which thousands of Americans were dropping out of the workforce. Still, 11.3 million jobless people continued to look for work. Economists called the report a "mixed bag," "underwhelming" and "disappointing." The conflicting picture comes from two separate surveys conducted each month, which don't always match up. The first survey asks businesses and government agencies about their hiring, while the second survey covers employment status of individual households. The cloudy picture of the job market isn't likely to clear anytime soon. 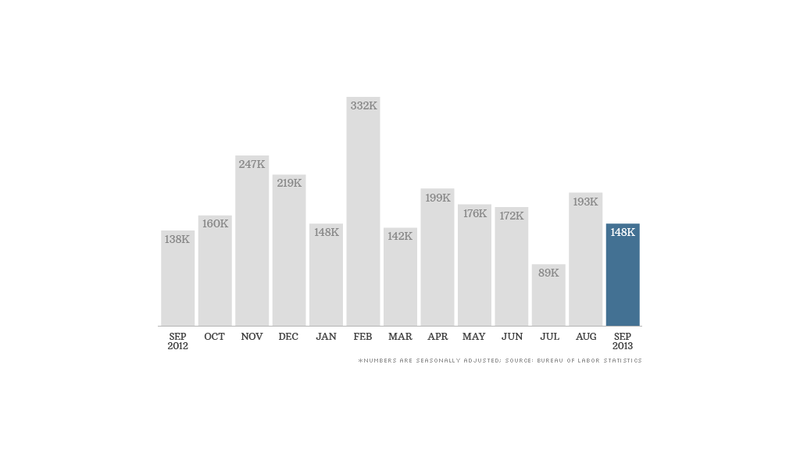 The economic impact from the shutdown is expected to show up in the October jobs report. Its release will also be delayed until November 8. That makes it unlikely that the Federal Reserve will start cutting back on stimulus this month. The Fed meets next week to reevaluate its plan for winding down its bond-buying program. But independent economists expect policymakers will want to see more data on how the shutdown impacted the economy before they start cutting back on the $85 billion a month in bond purchases. "The economy is too fragile for the Federal Reserve to touch," said Sung Won Sohn, economist at California State University Channel Islands. "The latest job numbers indicate that the economy is growing at a modest pace at best." Economists at Goldman Sachs, Barclays, Credit Suisse, BNP Paribas, Deutsche Bank and Capital Economics agree: The Fed probably won't slow its asset purchases until January or March of next year. Stocks rose Tuesday as investors also interpreted the lower unemployment rate as a sign that the Fed will continue stimulating the economy in the months ahead. Share your story: Are you delaying your start in the workforce? Construction firms added 20,000 jobs in September, more than the previous five months combined. Temp agencies hired 20,000 workers and state governments added 20,000 education jobs. Retailers hired 21,000 workers, marking six straight months of strong hiring for the sector. Meanwhile, restaurants and bars suddenly cut 7,000 jobs -- the first job loss in the industry in three-and-a-half years. The average American employee worked 34.5 hours a week and earned $24.09 an hour in September, up 49 cents, or 2.1% from a year ago.